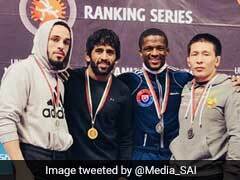 Olympic champion Vladimir Khinchegashvili pulled off a stunning victory over Mongolia Eedenebatyn Bekhbayar of Mongolia in the 57 kg contest to help Haryana Hammers surge 2 -1 ahead in the early stages. 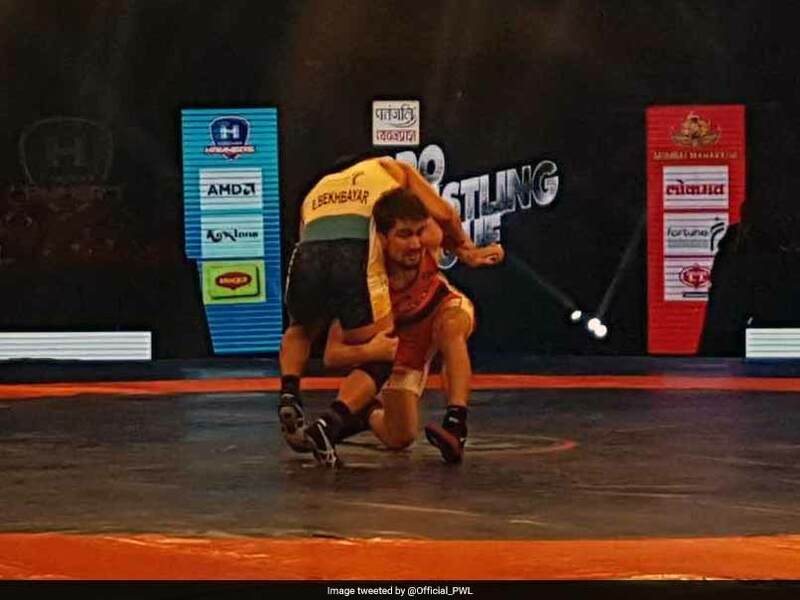 Asian championship silver medalist Sumit Malik overcame Satender Malik to guide Haryana Hammers to a tense 4-3 win over Mumbai Maharathi in the Pro Wrestling League on Saturday. Tied 3-3, Satender played with flair and determination to stave off his compatriot and win the crucial bout 4-0 to help his side seal a spot in the semifinals. Down 2-3 and looking at an imminent defeat, Mumbai's icon player Sakshi Malik kept them alive, thwarting a stiff challenge from Sarita Mor to make it 3-3 in the tie. Sakshi, started off well but Sarita was equal to the task, keeping pace with her. 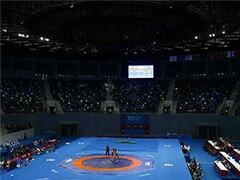 The Rio Olympics bronze medalist, however, showed her skill to eke to out a narrow 5-4 win at the Siri Fort Sports complex. In the fifth bout of the day, World Championship runner-up Khetik Tsabolov underlined his superiority with a comprehensive 16-0 victory over India's Praveen Dahiya in the 74-kg competition. Khetik looked to be at his dominating best and ran past his opponent within just two minutes to put his team in a strong position. Earlier in the day, Hammers after winning the toss chose to block Satyawart Kadian, while Mumbai used their card to keep Pooja out of action. Russia's Soslan Ramonov got Mumbai off to a winning start after he picked up a dominating 15-1 victory over India's Harphool in the 65 kg competition. The Olympic champion was quick to get off the blocks and raced to a 6-1 lead in the opening period. He continued his attack in the second round as well and strolled his way to an easy victory. Olympics bronze medalist Sun Yanan of China drew level for Haryana in the next bout after she got past India's Seema Bisla in the 50 kg women's competition. Sun has been in stellar form in this year's tournament and she once again asserted her supremacy with a convincing 9 -4 win. Bekhbayar who had taken to the taken to the mat for the first time this season started off on the front-foot and took a 4-0 lead. It looked like he would go on to win the contest but the Georgian turned the tides in style to win 8-2 eventually. In the fourth bout of the day, Nigeria's Odunayo Adekuoroye beat Pooja Gahlot 4-2 in the 57 kg women's event to help Mumbai restore parity. Pooja, who came in as a replacement for World champion Helen Maroulis was no match for the Nigerian as she went down 2-4 via fall in a rather meek fashion. Helen was feeling a slight pain in her leg after her defeat to Pooja Dandha in her last encounter and decided to skip tonight's match after consulting with team doctor and her personal doctor. She will be able to wrestle for the Hammers again in the season's last league stage encounter against the current table toppers UP Dangal.